Facebook Photo's Remarkable Growth - Did iPhone App Play a Role? 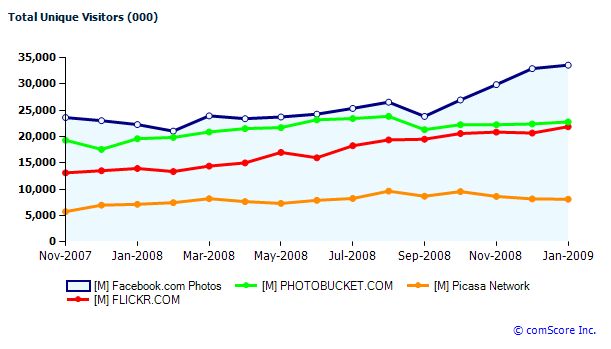 According to ComScore (and via TechCrunch), Facebook Photos is running away from the nearest competitors: Photobucket, Flickr and Picasa (in that order). "But the tagging feature has been part of Facebook Photos for a long time. What happened in September to accelerate growth? That is when a Facebook redesign went into effect which added a Photos tab on everyone’s personal homepage." 1. The iPhone App is one of the most popular and addictive. And it makes photo taking / sharing dead easy. In fact, it is easier to upload a photo than to enter your 'status update.' Based on my network's feed - photo usage via the App has grown significantly. 2. Switching cost: once you begin to upload photos onto Facebook, it becomes difficult to move them elsewhere or start uploading elsewhere. The switching costs are high and there are network effects. As Facebook grows (and it is everywhere now), there is less of a reason to share via print sites like oFoto / Kodak, Picasa, Shutterfly and so forth.